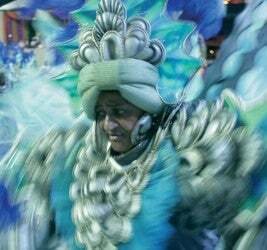 Carnivals take place in many cities and although they can all be colourful and spectacular, together with their own characteristics, none can compete in sheer scale and numbers to the one that is held annually in Rio de Janeiro, Brazil. For the photographer it is a riot of colour, spectacle and drama combined with stunning-looking participants whose energy is infused by the intoxicating music. Although it is all too easy to get carried away at an event like carnival, there is nothing like a little forward planning. For a start the first procession, or ‘school’ as they are called, begins at 10pm. The last one finishes around 6am! Apart from having the physical stamina to keep going, if you are shooting RAW, like I do, and only get around 40 shots on a 1GB card (this is the capacity I get on my new Canon EOS 1DS MK 2 which delivers 16.7MP), you will have to make provision for the downloading and storage of images. Over an eight-hour period and seven schools it is easy to get through the equivalent of ten 1GB cards! As a rule I download my cards into my laptop and then back-up on my 80GB Firelite pocket drive, which NEVER leaves me! Remember, a digital image does not exist until it is backed up at least once. The next consideration is the lighting. artificially by floodlights and the illumination of the various floats. those taken close in or that could be taken from a higher viewpoint. use too slow a shutter speed as the dancers could disappear altogether. I checked the LCD to make sure that I had got just the right speed.